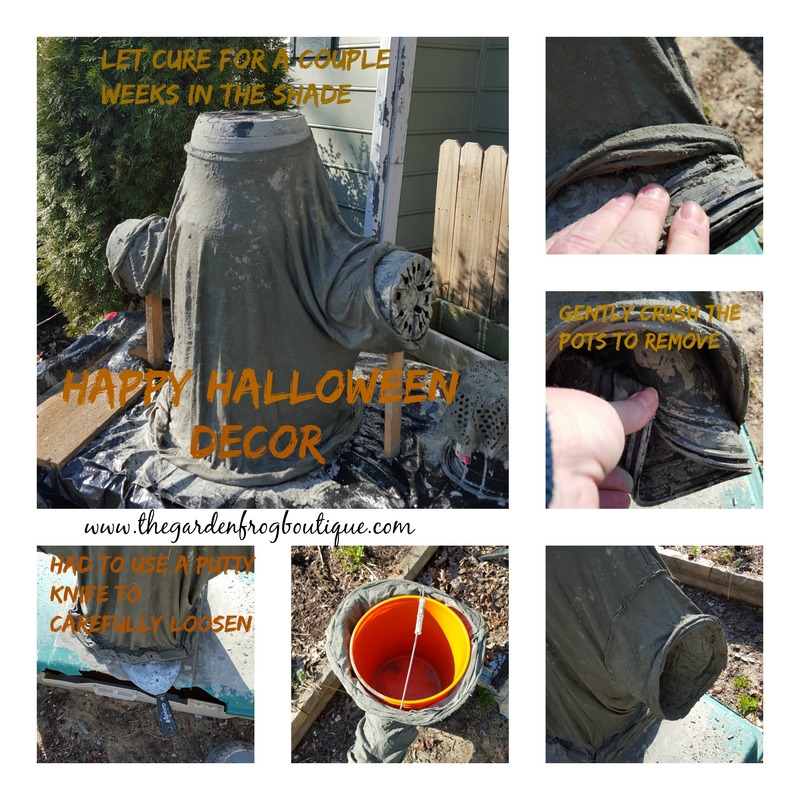 Easy Concrete Halloween Garden Statue Tutorial so you can display your ghoulish pumpkins and Halloween decor. 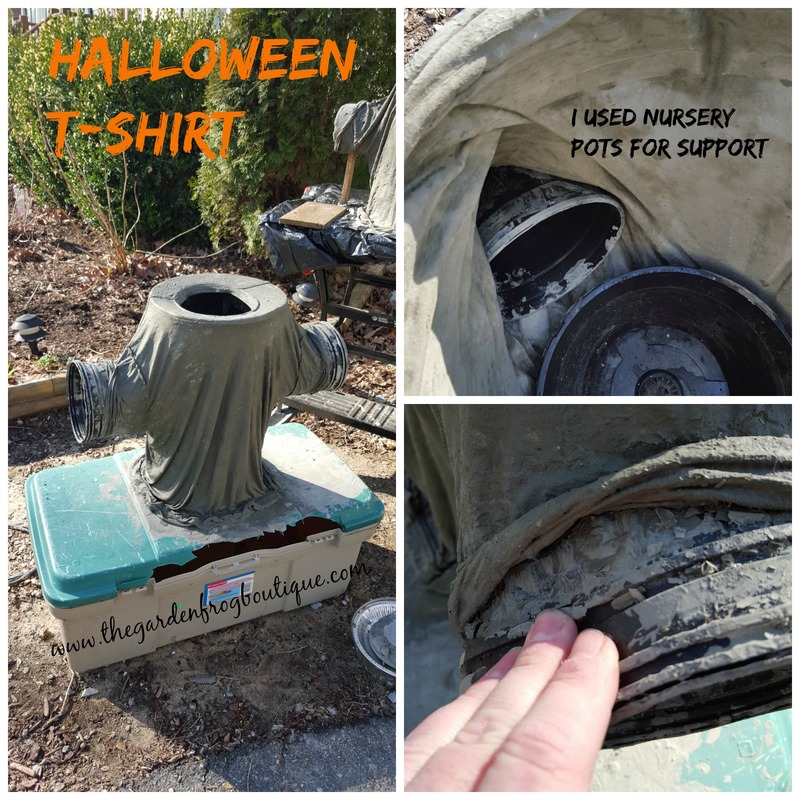 I created this concrete t-shirts in March right before a snow storm and freeze. I put them in the back of my yard all summer in the heat and humidity to make sure they would stand up before I wrote this tutorial. They are not rock hard solid as a stepping stone but they are strong enough to stand up with or without the pots inside. 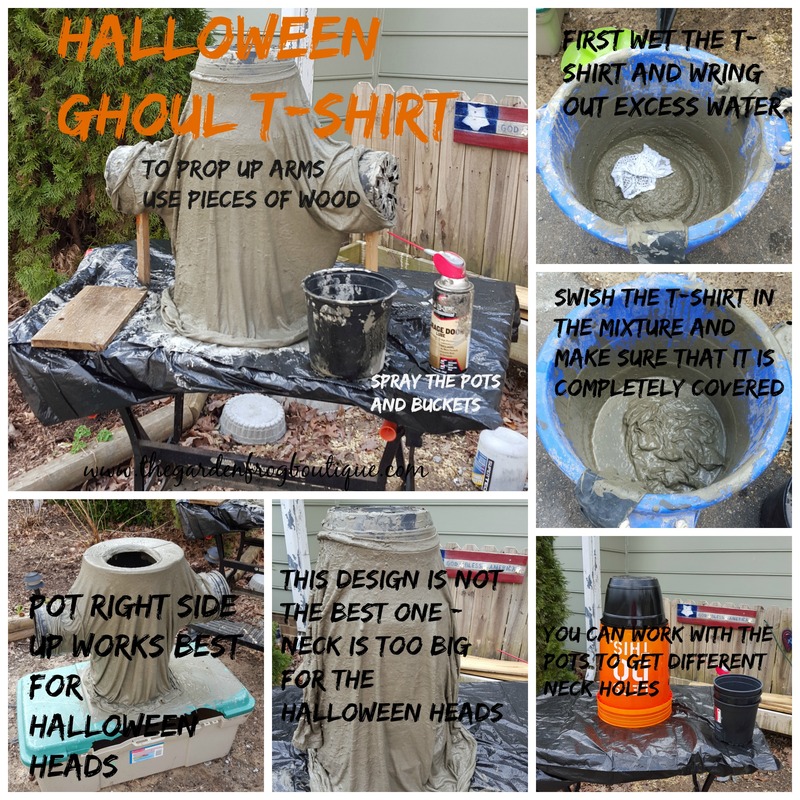 Now there are a few bloggers out there who say you need all this stuff for a concrete project- all I used was Portland Cement (from The Home Depot) and made a thin mixture to soak and coat the old t-shirt in. It is important to get the t-shirt wet and wring out any excess water before putting the shirt in the mixture. The wet t-shirt then can absorb the concrete mixture and you need to hold up the t-shirt frequently while mixing it in the tub of concrete mixture to make sure it is thoroughly coated. If you want a mixture that is thicker and possibly more durable, then make a thin hypertufa mix because these t-shirts are a bit pliable and could be made stiffer with hypertufa. However, the t-shirts will not look as smooth as mine do just using Portland Cement. I did the t-shirts right after I made my concrete baskets so there may have been remnants of hypertufa mix in this mixture. The t-shirts are smoother than if I used hypertufa. All I really did was shape the t-shirts around nursery pots (and a bucket) to get the shape close to a human body. The best t-shirt I made is the one where I left the pots in it and the neck was not stretched out. I do not have many pictures because this was an experiment that I was not sure would work. If you look in the above collage picture, you will see that I stuck 8″ nursery pots to shape the arms. To hold these arms up I used pieces of wood as stands until the mixture dried for a day. 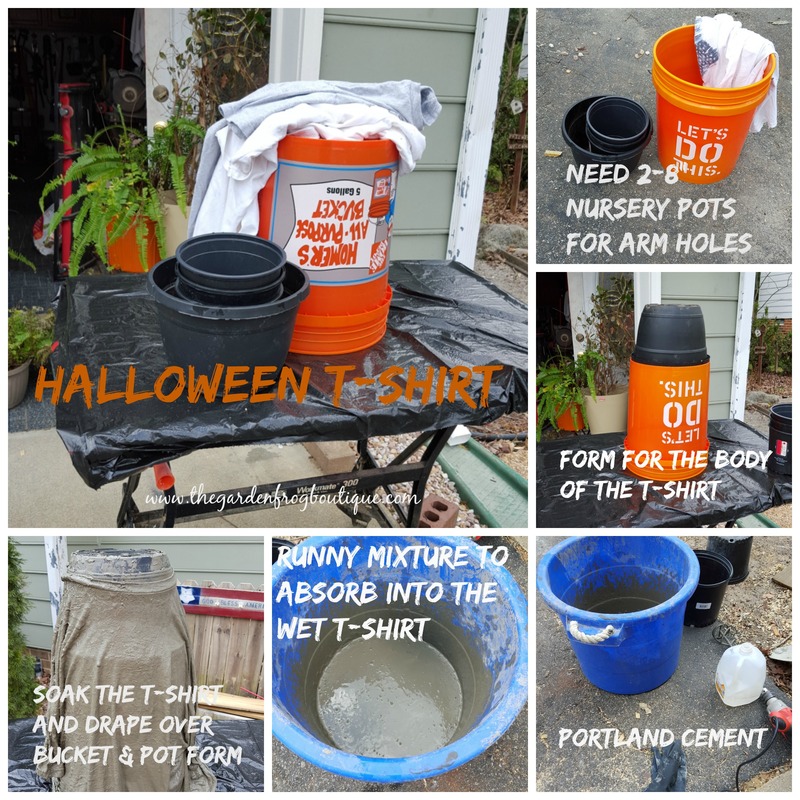 For the first t-shirt I used a bucket and hanging basket pot (which I sprayed really well with lubricant) and turned them upside down and draped the t-shirt over it. I did not have a picture of the arms but it is similar to what I did for the second t-shirt. I also discovered that I needed to make sure that if I am going to take out the pots, I needed to have the one on top slightly smaller as the bottom so when I took it out the top one would fall out. Creating is trial and error and sometimes you figure out how to do it again even better. The nursery pots for the second t-shirt are 3 gallon pots and the bottom pot is upside down while the the top pot is right side up. I ended up leaving the pots inside the t-shirt with the small neck because I was afraid of cracking the t-shirt because I did not spray the pots well enough with lubricant. Then I realized that pots made this t-shirt a bit sturdier. For the bottom of the t-shirt I curled up the bottom of the t-shirt to create the rim you see in the picture. I put these t-shirts on a plastic tarp and sheet of plastic to cure so I could just peel them off later. 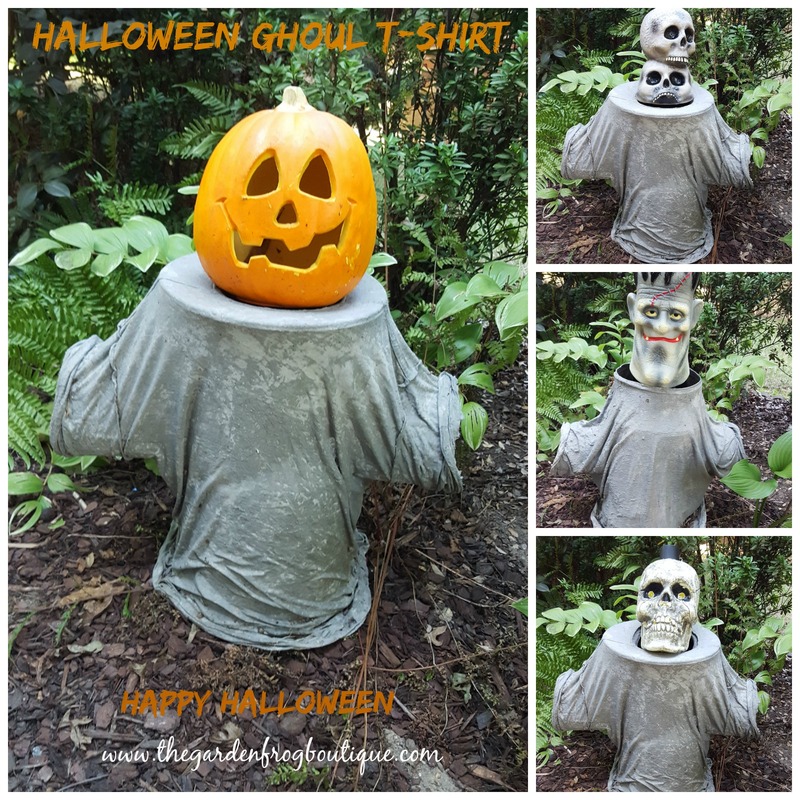 You could use long sleeve t-shirts too and that would really make for a cool Halloween ghoul. 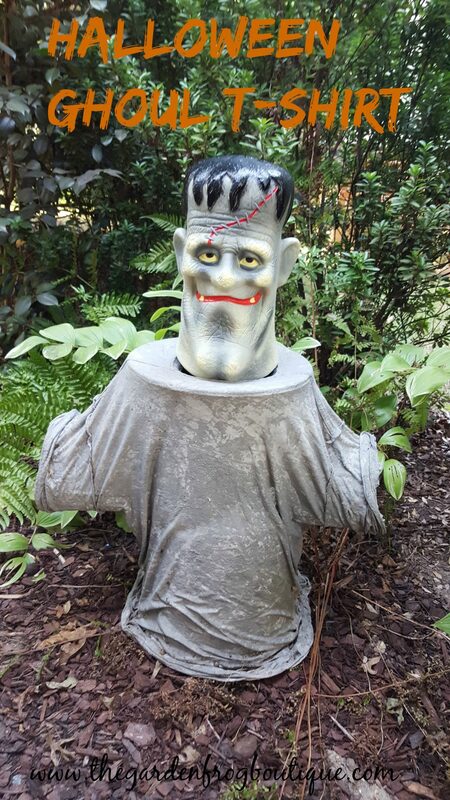 This fun idea could be adapted for any Halloween pumpkin or scary ghoulish head. You could even paint these in ghoulish colors for Halloween and look for plastic arms to create an even more ‘realistic’ statue. Finding props to create the shape of the ghoulish t-shirt will be the challenging part. Have fun. Thanks for stopping by and I hope this gives you ideas for Halloween decorating! And if you ever have a question, contact me and I will do my best to answer it.